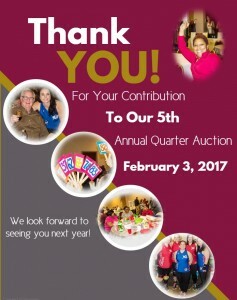 What an awesome 5th Annual Quarter Auction event! Thank you to all our supporters, volunteers, community members and local vendors for this inspiring evening of FUN on February 3, 2017. What an exciting night we had! With over two hundred people to join us for fun and mayhem. Big thanks again to our staff for their great gift ideas and outstanding baskets. Lucky winners like our very own Accounting Manager, Jim Arcipowski walked away with the Pot of Gold basket. The excitement didn’t stop there! We had a lucky Benjamin winner, Valentine Package winner and more lucky winners. Our happy auction winners received their items with the quickness from the Confluence Crush Roller Derby. Thanks to your support of our event, United 4 Children raised $3,200. We hope you will join us again next year for our unique Quarter Auction. Here are some photos from this exciting event.